I'm back from the UK after a six-week sojourn. I hope you are all enjoying the Summer - I have a very tanned - and pimply - face to show, thanks to the sun in Rome. Here is a quick Summer giveaway for readers in the US (Rest of the world, there's a huge giveaway coming up after I unpack). 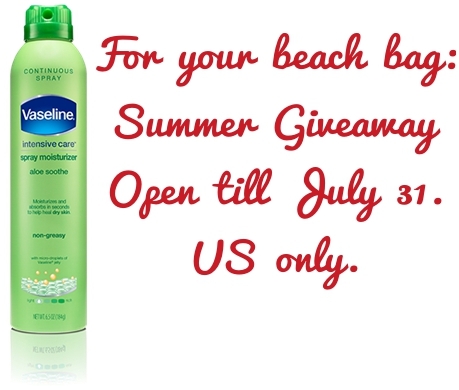 Vaseline Intensive Care Aloe Soothe Spray Moisturizer is ideal for your beach bag. It is lightweight and contains micro-droplets of Vaseline jelly as well as pure aloe vera, to keep you hydrated in the Summer. It is absorbed easily and is spray-on, and leaves no greasy residue. What more can you ask for from a Summer moisturiser? This giveaway is open only to those residing in the United States of America. One winner will receive a bottle of Vaseline Intensive Care Aloe Soothe Spray Moisturizer. This giveaway ends on August 1, 2015. The prize is sponsored by Vaseline, who will ship it directly to the winner. I only host the giveaway. My responsibility ends once I pass on the winner's details to Vaseline. Neither I nor Vaseline is responsible for duties, surcharges and other taxes or if the product is damaged or lost in the post. Please do not enter with multiple IDs or contact me asking to choose you as a winner. a Rafflecopter giveaway Good luck to all who enter! Those who are not eligible for this giveaway, please stay tuned for a BIG giveaway once I unpack and settle down.